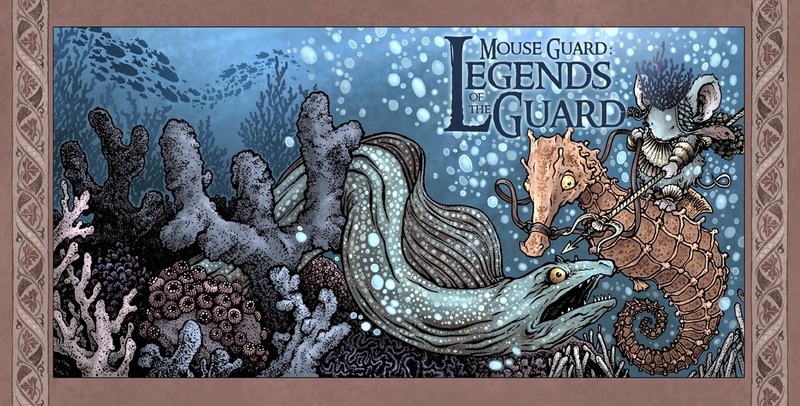 I'd done a commission for a fan a while back who originally wanted "Aquaman as a mouse", but that was at the time I'd stopped doing commissions of mice as things outside of how they would appear in my comics (no more mouse Batman or Boba Fett). 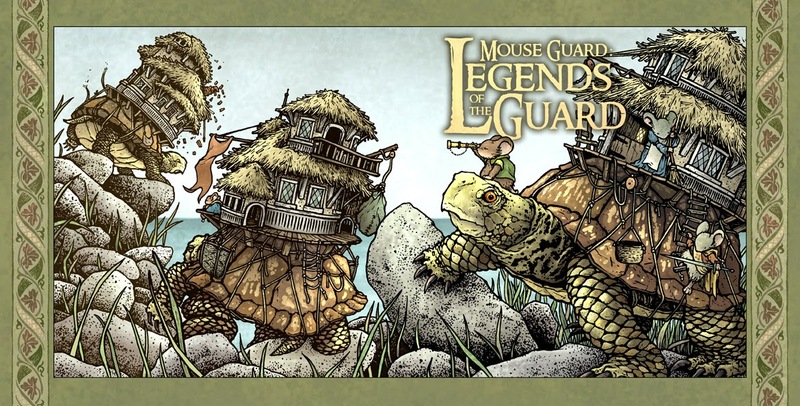 I drew that commission in the spirit of an Aquaman type character, but as they would appear in a Mouse Guard legend. I went back to that piece for inspiration while sketching out the elements of this cover. 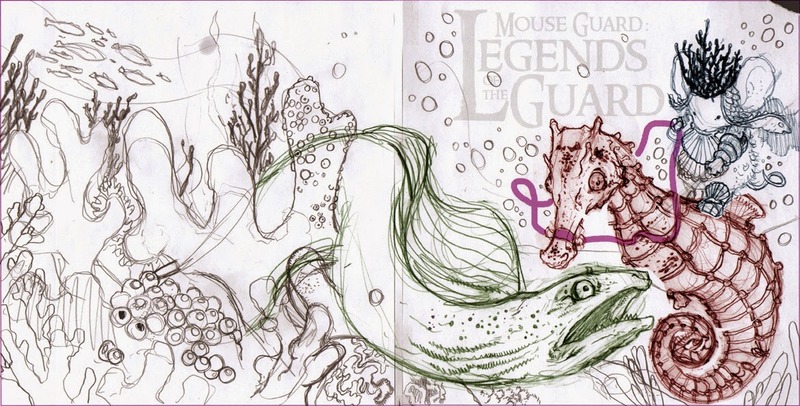 The seahorse, coral crown, seaweed cape, and trident stayed, but I wanted to do more with the mouse's costume and also add some menace with the eel. 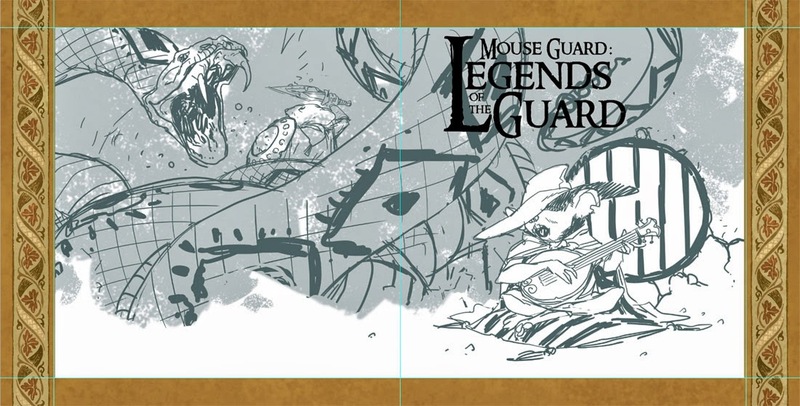 Putting the patchwork of sketches together into a viable layout that works with where the cover fold is as well as the book's logo is a job to be done in Photoshop. I tinted the various sketches to help make it easier to see them as separate elements. I mirrored the mouse & seahorse to fit around the logo, I also had to cut apart and distort the seahorse to get the posture right. The image shown is a printout of my digital layout, but all the undersea landscape you see I roughed in in pencil on the printout itself. I taped the printout (with drawn landscape elements) to the back of a sheet of Strathmore 300 series bristol. Then using a lightbox, I can see through the bristol to the printout and use it as my 'pencils' to ink from on the bristol surface. Texture & pattern became a big part of this piece. 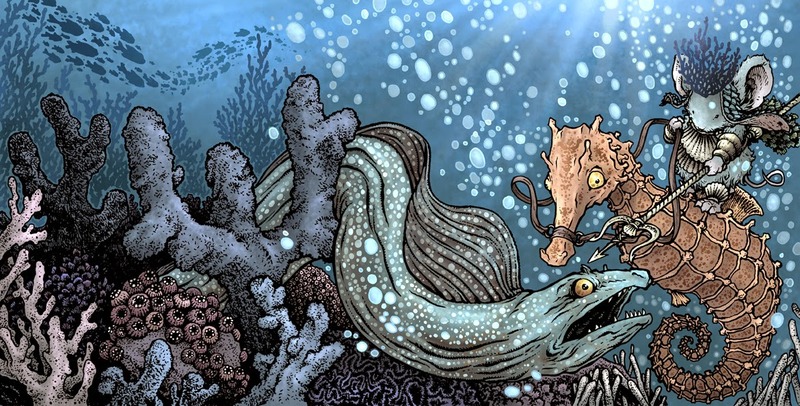 I looked at photos of real seahorses & eels as well as lots of coral formations and sea floors to get inspired about the types of lines & marks I'd use and how dense to pack them. After scanning the inked piece, the longest part of setting up the color file was establishing the color holds (areas inked black I want to be a color instead). 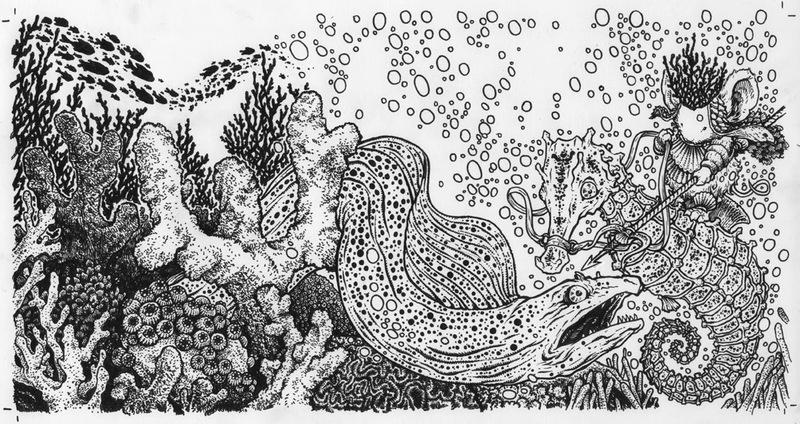 There were a lot of them on this cover: the bubbles, the fish, the eel dots, the seahorse pattern/dots, and the coral. 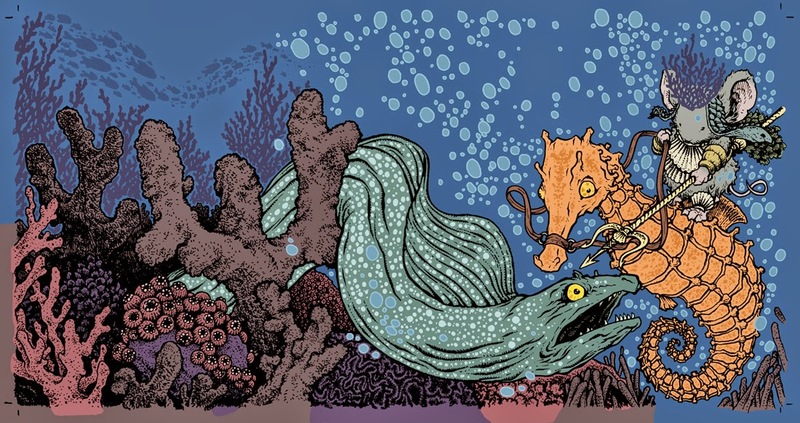 The rest of the setup is laying in flat un-rendered colors (which may or may not be my final color choices) The goal is to establish the various color areas, that the eel's eye is different color than his body, that the one type of coral will be a color other than the coral piece next to it, etc. The last step is to render the image and add shading, texture, highlights and special lighting effects. I use the dodge (lighten) and burn (darken) tools to get most of the work done, though I did use a paint brush and isolated areas with the lasso to give some subtle color shifts on things like the eel's body. The colors are muted a bit compared to my initial color flats, but this is a case where I was pretty close with my gut instincts. 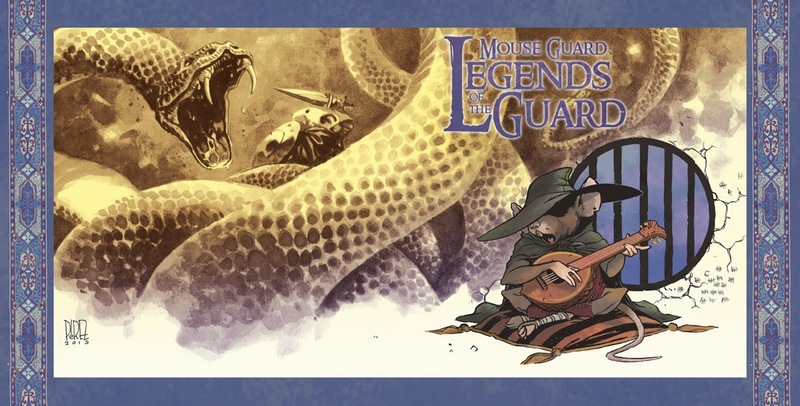 Legends of the Guard Vol 3 issue 1 will not only have my cover (seen left) but the first issue will also have variant covers by Ramon Perez (Tale of Sand), Humberto Ramos (Fairy Quest), and Eric Muller. 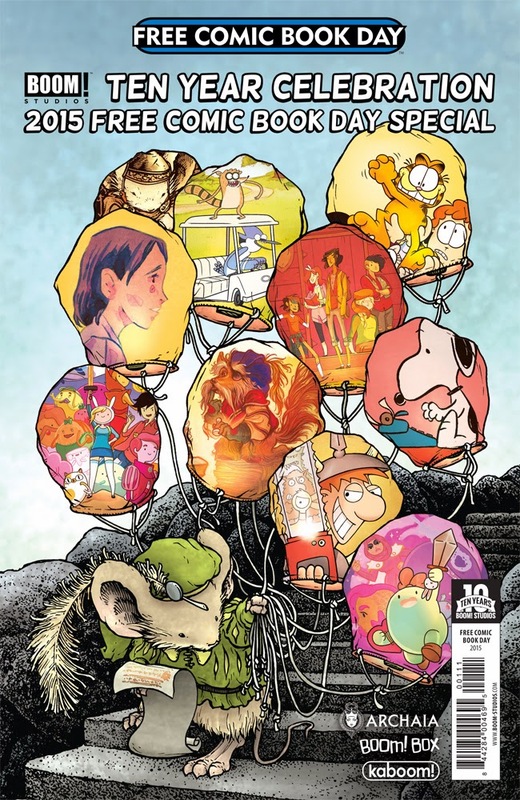 The Eric Muller cover will be an intermix cover of a 10% ratio IF the total issue run gets above 10,000 copies. 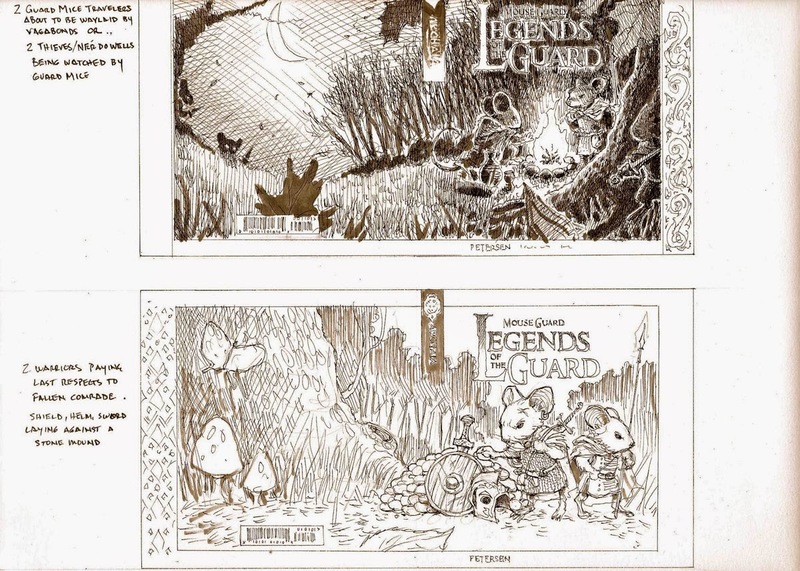 Like my traditional Legends covers, the inside of the issue will have a one paragraph story of what the "Legend" is depicted on the cover for each of these variants. And for the interior? 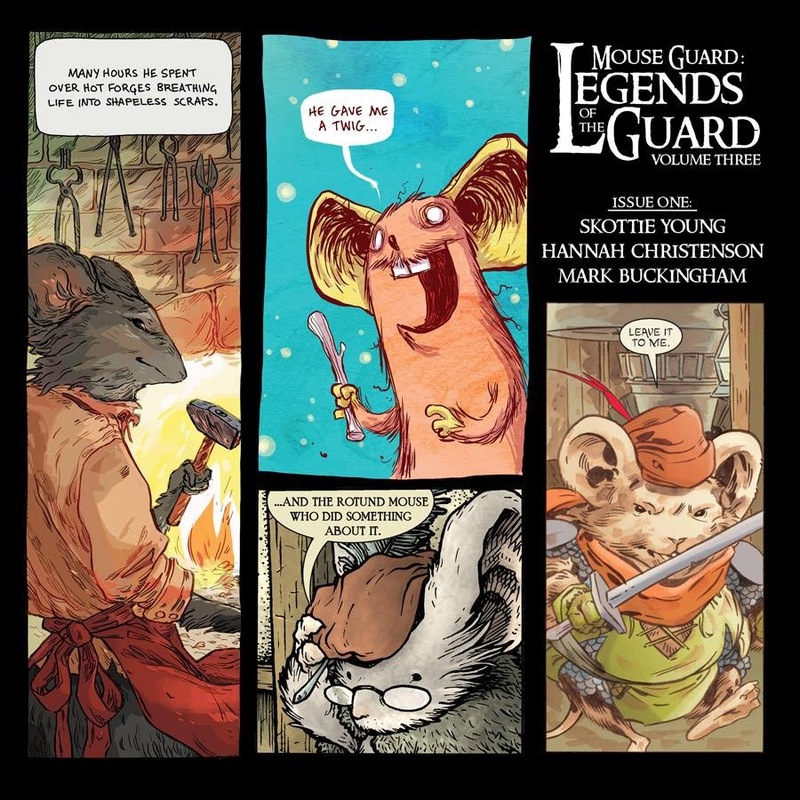 Legends told by Skottie Young (Rocket Raccoon), Hannah Christenson, & Mark Buckingham (Fables) with intercut tavern scenes of the storytellers at the June Alley Inn by me. Below are the roughs/pencils for the variant covers by Humberto, Ramon, & Eric! 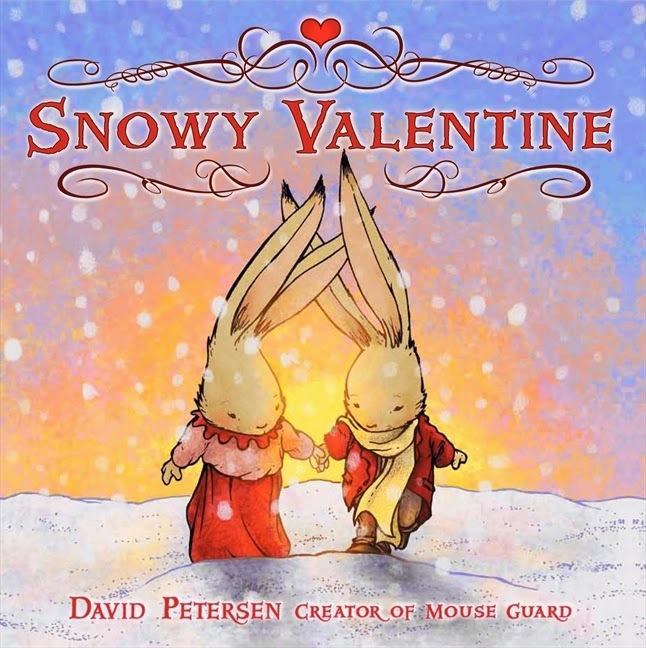 This week, with Valentine's Day just around the corner, I wanted to reshare some of my past posts about my Valentine's Day themed Children's Book: Snowy Valentine from Harper Collins. 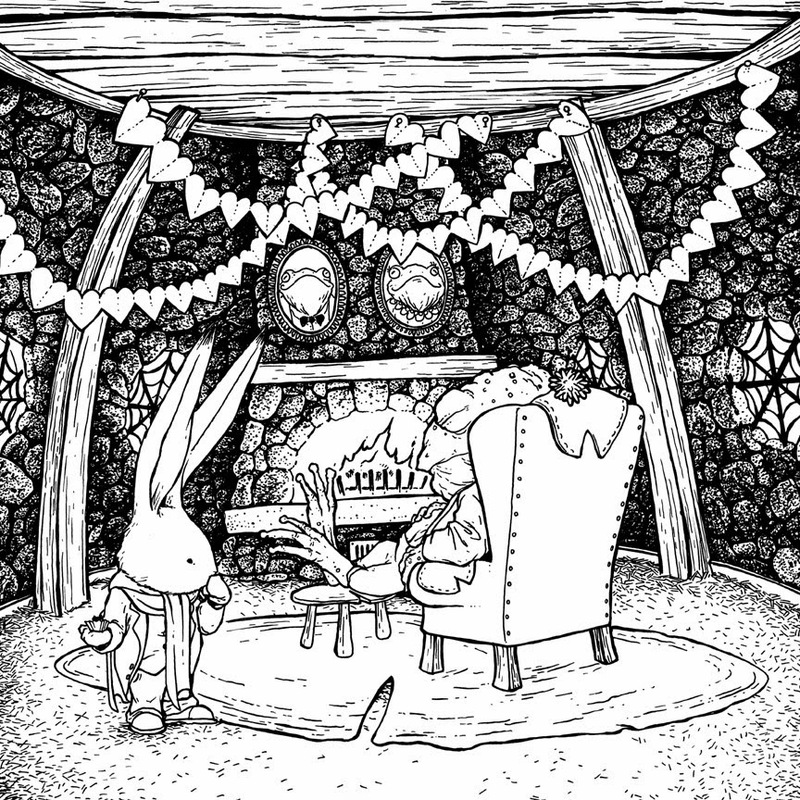 It's a story about Jasper Bunny as he awakes on Valentine's morning realizing he doesn't have anything for his bride, and that he's unlikely to find the special something she deserves when the land is blanketed in snow. 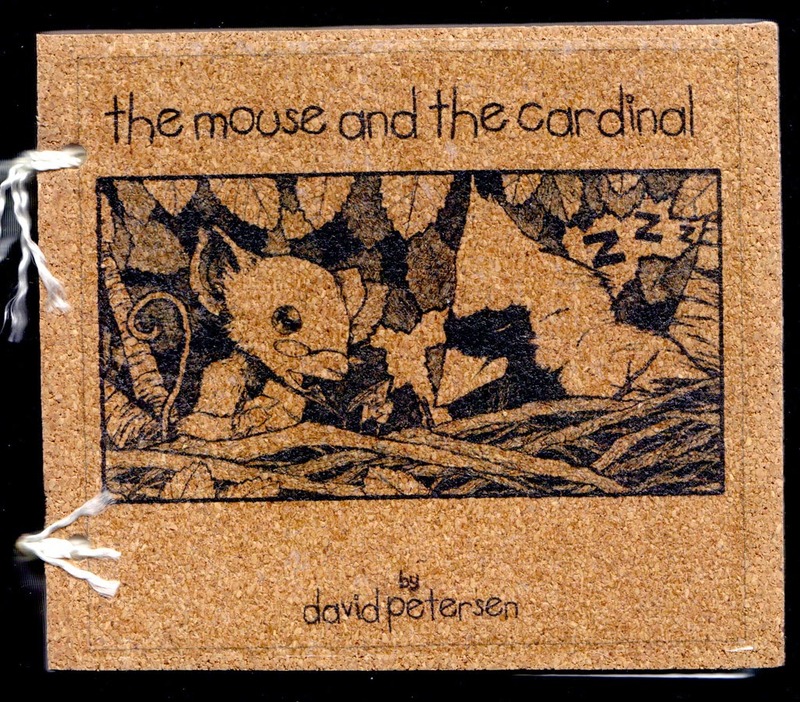 In this post, I go over the original book I handmade for Julia that was the inspiration for Snowy Valentine and my first drawing of Jasper Bunny. Here I share the sketches of the characters and scenes that would become the dummy book layout. And also finished ink drawings of some of the final illustrations. Finally, with the book drawn, I add color and texture with photos of fabric samples and odds & ends around the house. And the many stages of getting the cover just right. 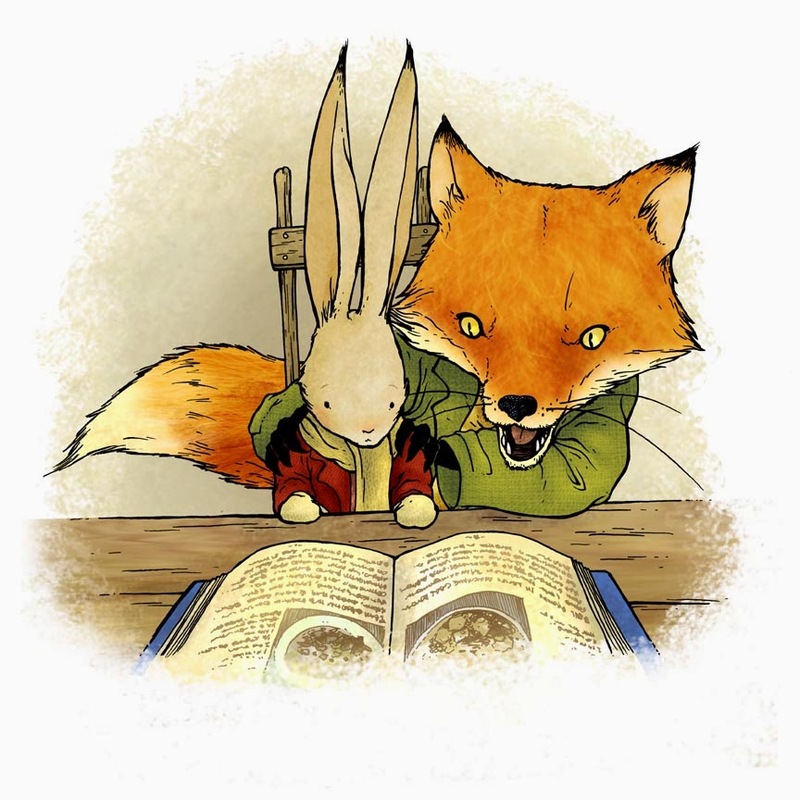 PS: I have commissioned the talented puppet builder James Wojtal Jr. to build a puppet version of Jasper Bunny that I can use for library/school readings as well as to pitch to Harper Collins for the possibility of doing a small stage show of the book. This year for Free Comic Book Day, BOOM! 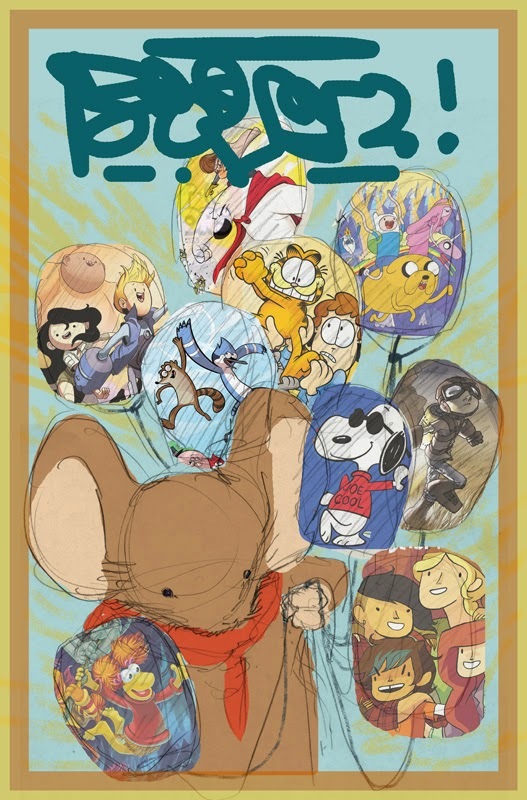 & Archaia will have a joint anthology publication featuring stories from all their various imprints. I was asked by my editor, Rebecca "Tay" Taylor, if I'd be willing to do the cover art! 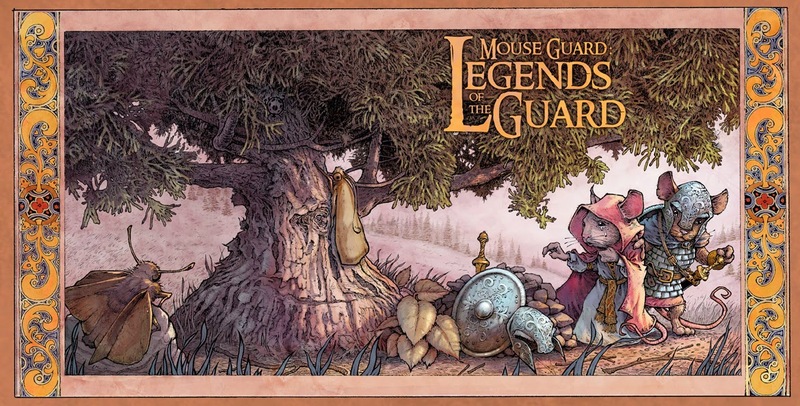 A daunting task to represent the full contents featuring 10 different stories/properties (including Mouse Guard). 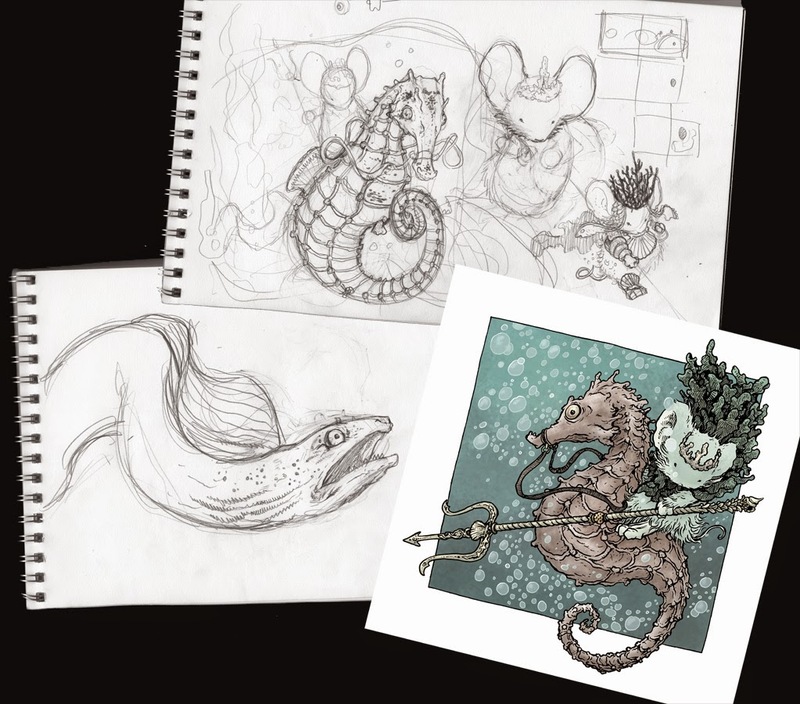 The cover to the left is the final publication art, but below I'm sharing the process for developing this cover. Tay said the staff had been tossing ideas around for the cover concept (and how to show off all 10 stories). 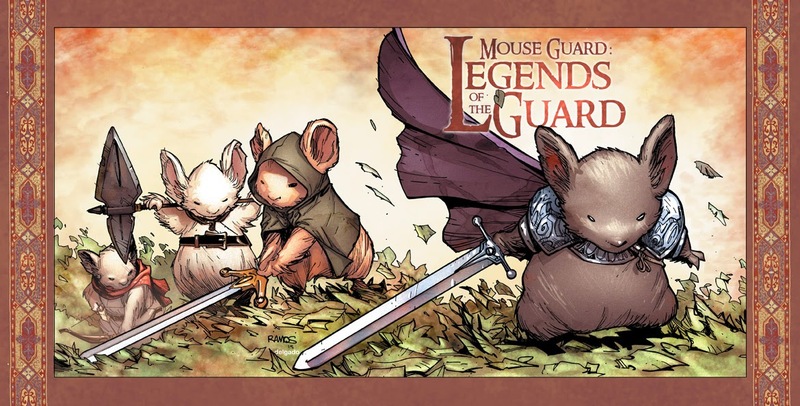 This year is a double celebration as it's both Mouse Guard and BOOM! 's 10th anniversaries, so a party theme with either cake & candles or balloons were suggested. Of those options I preferred the balloons. 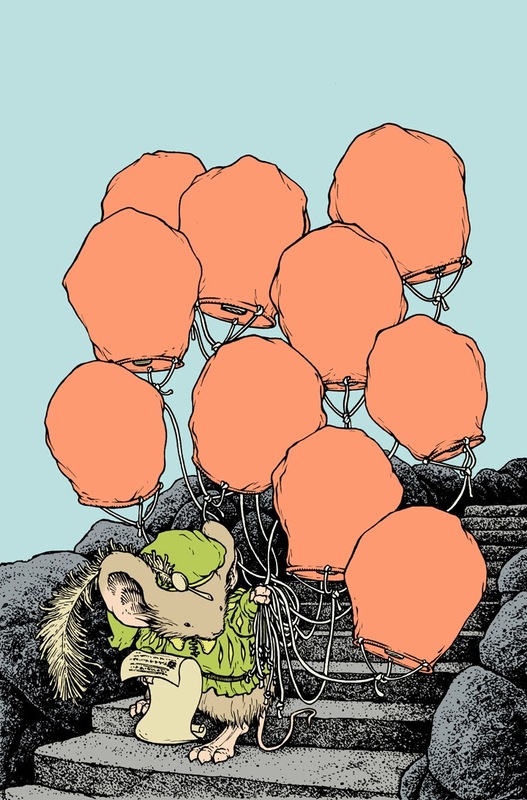 Each balloon would then have art from each story placed on it. 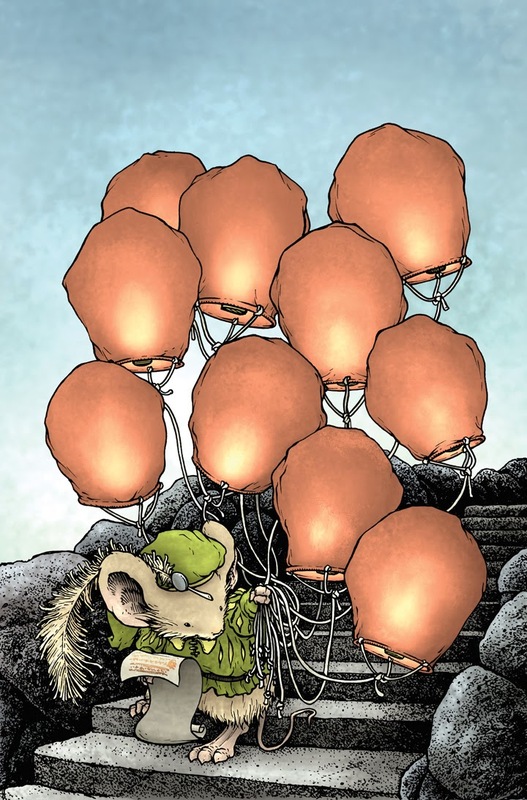 I'd wrestled about showing Mouse Guard mice with balloons when it was a commission request, but I opted for floating paper lanterns in their place, so I did the same here. 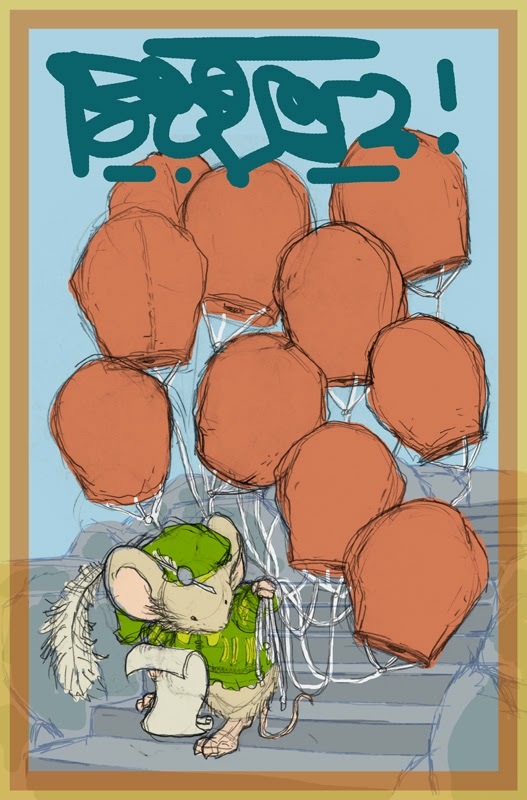 Below are the 2 variations I came up with, one featuring a close up of the mouse and jam-packing the rest of the cover with balloons...and the other a more illustrative scene. BOOM! chose the first, but I campaigned for the second and we ended up going with it in the end. I printed out my layout of the cover and taped it to the back of a sheet of Strathmore 300 series bristol. 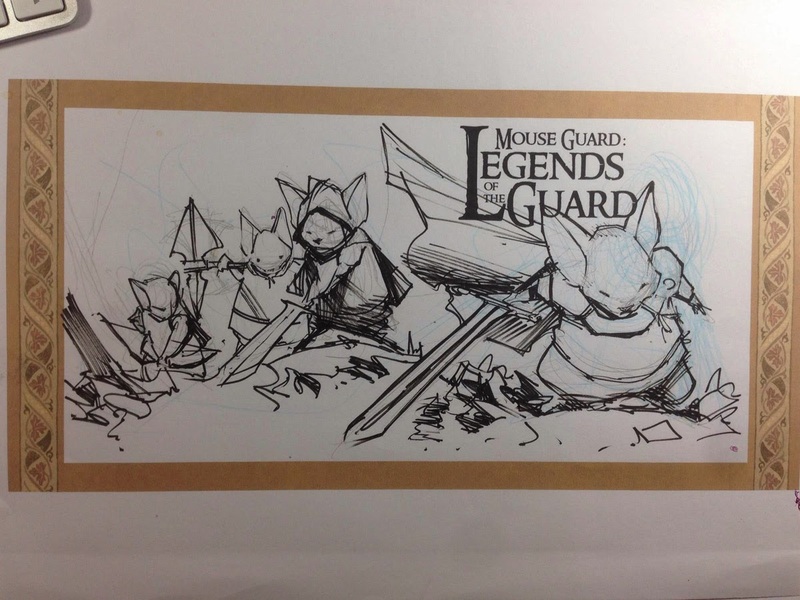 I inked the piece on a lightbox using the printout as my pencil lines to follow. 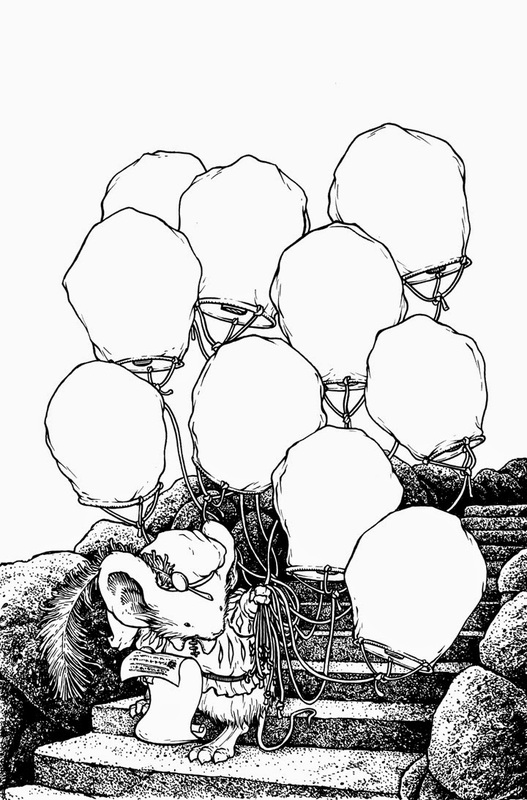 I gave a lot of texture and weight to the stairs partly because I knew I couldn't add much linework to the balloons since they were going to be filled with the art for the stories. The color flats on this cover were fairly straightforward since I'd already made a lot of color choices in the rough I sent over to BOOM! And the final rendering was done in Photoshop using the Dodge & Burn tools and a textured brush. To the left you can see the cover art without the other story art and logos.